Teaching writing in first grade is a huge job. Student ability ranges greatly. You will have some students who are not yet able to write at all and students that are filling pages. It is such a challenge to reach all these learners. I want to share one simple lesson that I have been using for a few weeks that is really working in my classroom. 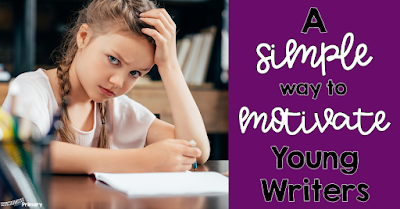 I have already shared my philosophy about teaching writing in another blog post. You can read all about it by clicking on this image. In my classroom, we write every day. Students go to Smart Spots, which are my modified version of flexible seating (you can read more about that in this blog post: Getting Started with Flexible Seating and they write! 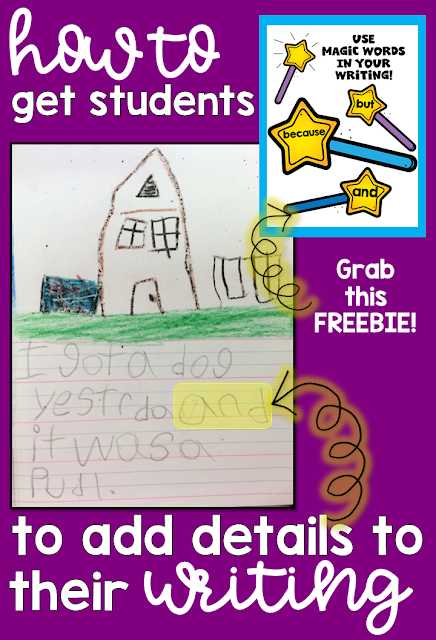 Those that aren't yet writing independently draw and those that can either draw or start right away on their writing. When I looked at my student writing as a whole, I noticed that they all needed to work on adding details to stories and writing more descriptive sentences. As a result, Magic Words was born. 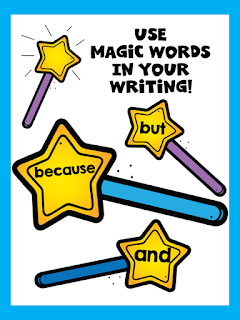 What are Magic Words in Writing? Have you noticed that the language you use can really captivate first graders? 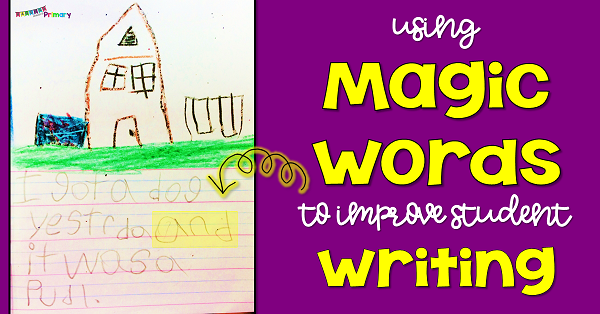 As soon as I told students I was going to teach them how to use magic words in their writing, they were hooked. I shared that some of them already used magic words and didn't even notice. I started by reading a few really simple sentences I made up, and then I reread them using a magic word. I asked them what they noticed, and it took a few sentences, but they got it: I was using AND or BECAUSE to tell more in my sentence. I have a dog -----------> I had a dog, and she is a girl named Moe. Now, this is not new by any means but by simply phrasing it this way with my students they totally bought in. They went off to their Smart Spots and started right away because they knew at the end of writing time I would celebrate the writing and share a few student's writing pieces that used a magic word. I worked at the table with my students who needed help, and they all formulated sentences using AND or BECAUSE which was not usually the case. For the most part, those students were writing simple sentences like I went to Nanas. It made my heart happy to see them push themselves too. I created this poster to hang in our Writing Center area as a reminder. I printed it in a poster format! You can grab a free copy for yourself by clicking on the image. I am totally guilty of not leaving time at the end of writing to share, but I am learning the value of a 5-minute lesson revolving around a piece of writing. It is really powerful to project a piece of writing on the smartboard that a student just finished and use it to highlight the goal for the lesson. It validates that student's work and allows the students in the class to see that it is attainable. Make time for sharing if at all possible! My challenge for you is to consider how you can use language to hook your students and get them excited about writing. I could have said to them we are going to work on adding more detail to our sentences. I most likely would have got what I wanted from some of my students. However, by phrasing it the way I did I got my whole class excited. It was a definite win! Take a moment to pin this post. I am a first grade teacher with a passion for designing resources for my students. 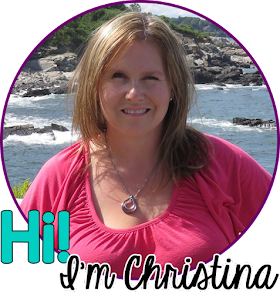 I have a husband and two busy teenagers who keep my life busy and full! I am so glad you are here! Guided Reading: How to get Students Excited About It!